This recipe is easy to do, because you don’t have to boil or peel the potatoes! Red potatoes are a good source of Vitamins C and B6. However, they are high in carbohydrates and diabetics need to be careful of the amount they eat. Scrub the potatoes well. Depending upon the size of the potatoes, cut them into 6 and 8 piece wedges (like apple wedges). In a large bowl, mix the potatoes thoroughly with the olive oil. Add garlic, salt and freshly ground pepper. Preheat oven to 400 degrees. On a jelly roll pan lined with foil, place the potatoes skin side down, so that the flesh of the potato is facing up. Roast the potatoes for about 35 minutes. They should have a nice brown appearance. Take them out of the oven and sprinkle with the grated Parmigiano Reggiano. Put them back into oven for another 10 minutes. 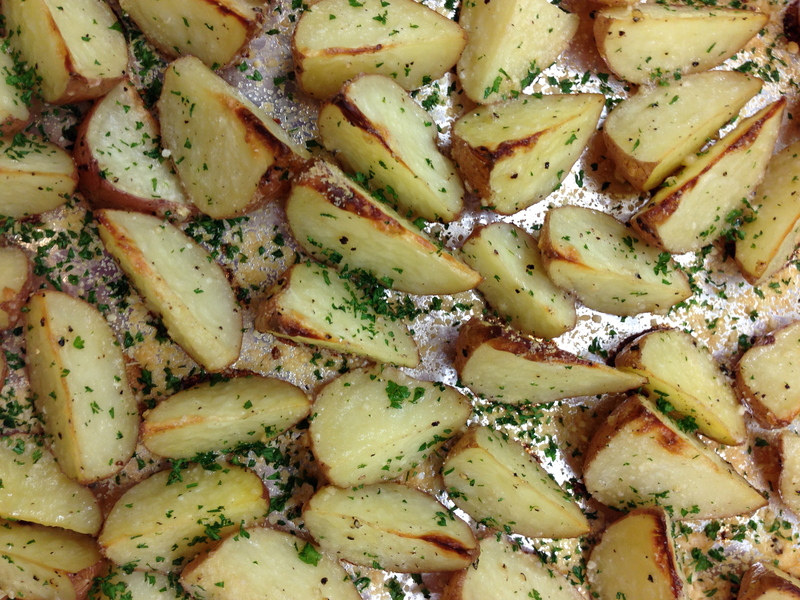 Take the potatoes out of the oven again, sprinkle them with the parsley and roast for another 5 minutes. Taste and add more salt and pepper, if needed. Serves 8.